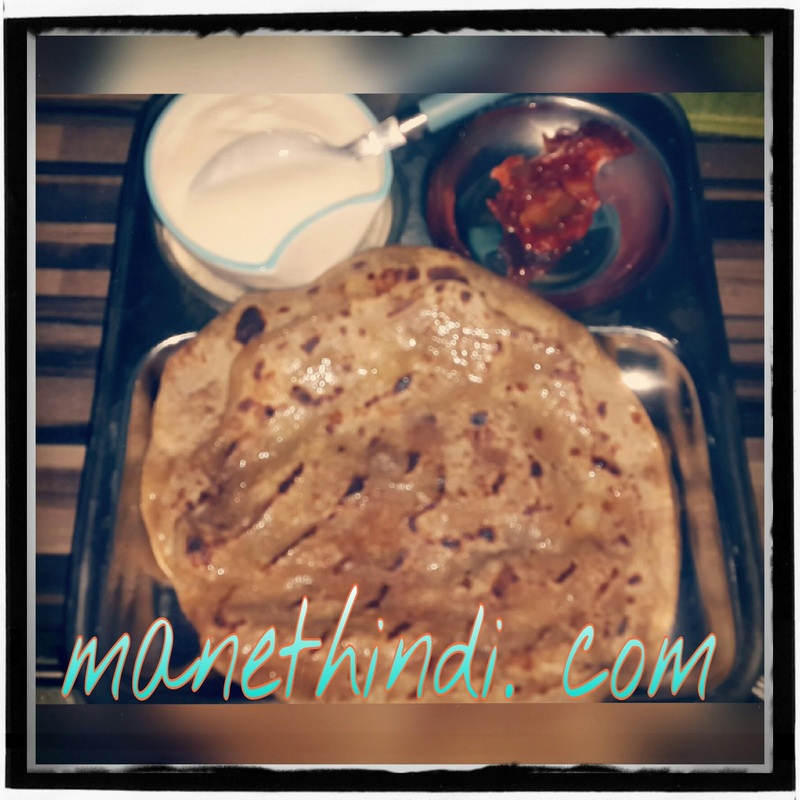 Aloo paratha is a Popular breakfast /brunch dish. first boil the potatoes and peel them. Now mash the potatoes very well, there should be no lumps or small pieces in it. Now add the chopped green chilies, garam masala powder, red chili powder, dry mango powder and salt. mix the spices and green chilies with the mashed potatoes very well. check the taste and add more salt or red chili powder or dry mango powder as per your taste. Take a bowl and add whole wheat flour. make a well in the center. add salt, oil and about half of the water. bring the mixture together and knead into a smooth soft dough. cover and keep the dough aside for about 15 to 20 minutes. pinch a medium ball dough. roll and flatten it. dust with some flour and roll it in a circle of about 5 to 5.5 inches in diameter. place the potato stuffing in the center, keeping about 2 to 2.5 inches space from the sides. join the pleats together. the pleats have to be joined well, as otherwise there will be gaps while rolling and the filling comes out. in case you do see the filling, then just take a small piece of dough and cover the gap. roll to smoothen out the small piece of dough. press the pleats from center. sprinkle some flour and roll this version of stuffed paratha to about the same size as that of a chapati or roti. On a hot tava/skillet ,place the rolled paratha. the tava should be hot and not at a low temperaure. flip again and this time this side has to be cooked more than the previous side. you will see brown spots on the aloo paratha. spread some ghee on this side too. a well made and well roasted paratha will puff up. flip again once or twice till both the sides are cooked properly. you should see crisp brown spots on the paratha. you can also press the paratha edges with a spatula or spoon, so that they are fried well. Serve hot with yogurt and pickle!